What Happens When a Rabbit Has Her First Litter of Babies? Newborn rabbits have closed eyes and ears. They are completely naked of fur, though it grows to cover their bodies in a few weeks. A doe with her first litter may need some assistance in making a nest box. Some facts on doe feeding, nursing and weaning kits are helpful for an owner who hasn't witnessed the miracle of rabbit birth. 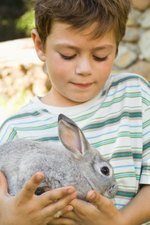 Don't handle baby rabbits excessively when checking on them. A doe normally will make a nest in her cage, pull her soft fur out and use it for a lining in the nest just before she gives birth. A rabbit who is having their first litter may not make a nest before she has babies. You can make a nest for her by putting a towel in a covered litter box or place her nest in the litter box. Place the nesting box in a quiet area of the home so she feels safe and secure. A doe only feeds her kits once to twice a day and for only 5 to 10 minutes at a time. This is enough time for the kits to have an entire day's worth of milk. If you don't see your doe in the nesting box very often, don't be alarmed. Some does seem to ignore the kits when they are not feeding. This is a survival instinct in rabbits to stay away from the nest so as not to attract predators. Provide your doe with an unlimited amount of food including rabbit pellets and green leafy vegetables as well as grass hay. Make certain she has a large supply of clean water as well so she will produce the maximum amount of milk for her kits. You may notice your kits starting to nibble at solid food when they reach 2 weeks of age. Your doe will start weaning them between the age of 4 and 5 weeks, though they will not be weaned totally until about 8 weeks old. You can remove the kits from the same area as the doe when they are weaned.